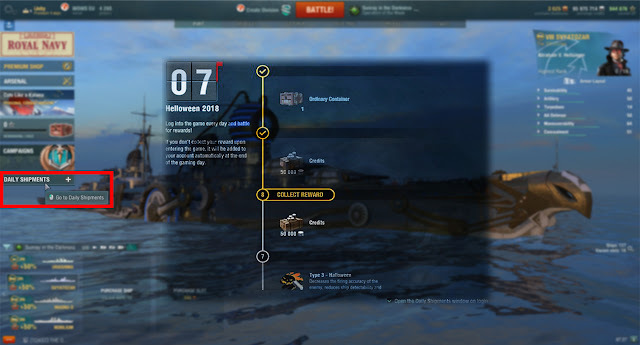 A new section will appear in the game called "Daily Shipments". Access it to view the list of rewards that you can get for simply logging into the game on a regular basis. During the period from October 31 till November 9, Daily Shipments will be inspired by the Halloween event. You can get a whole range of gifts during the period that include: Halloween-themed containers, credits, camo, Coal and doubloons. You can always check which reward will be yours on the next day and find out about your ultimate reward for completing the entire list. Novice players will have access to Daily Shipments, divided into four stages with each offering three gifts. Every stage will last for one week, during which players will need to log in to the game at least three times. The following stage becomes available either after all rewards have been collected, or when the week expires. 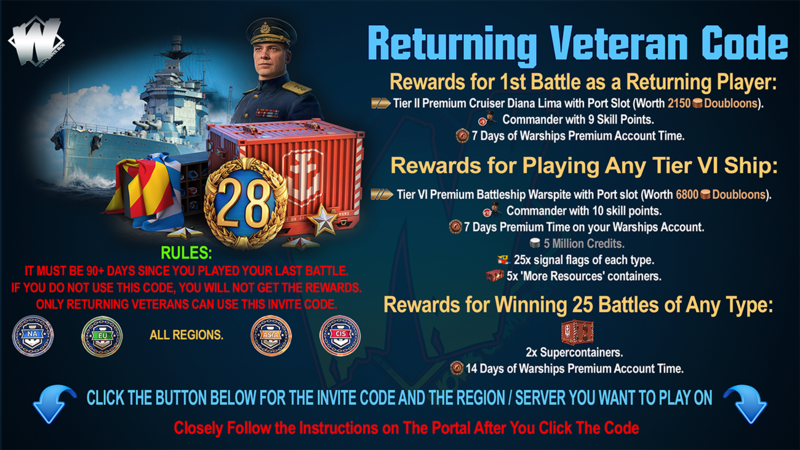 You get: credits, doubloons, a Premium ship, containers, one day of Premium Account time and one Supercontainer. 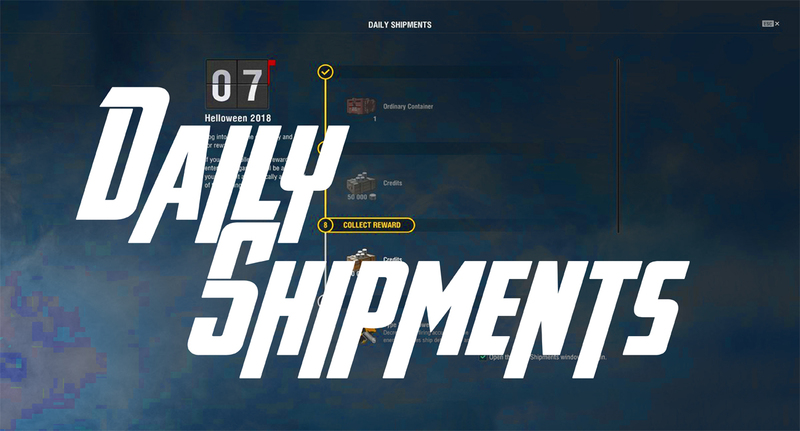 This type of Daily Shipment will only be available to players that reach Account Level 2 in their Service Record after the point that Daily Shipments hit the live servers. If you are already at Level 2 or higher when Daily Shipments are launched, you will have no access to this type of Daily Shipment. Looking for a lucrative offer? A special one-off shipment called "Business is thriving" will be available in the Premium shop. Stay tuned for more details on this offer on our official portal! Switch between the available types of Daily Shipments and keep an eye on what will be coming your way. You can enable or disable the display of the Daily Shipments window upon login, using the checkbox in the lower-right corner of the section. Will have access to Daily Shipments, divided into four stages with each offering three gifts. Every stage will last for one week, during which players will need to log in to the game at least three times. The following stage becomes available either after all rewards have been collected, or when the week expires. 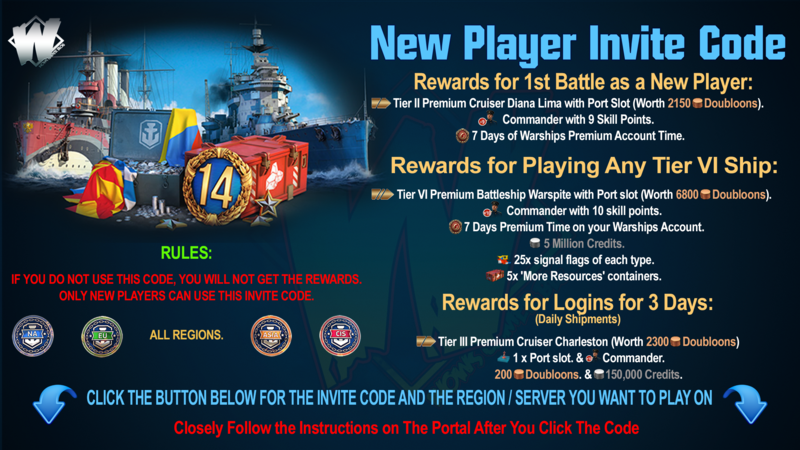 You get: credits, doubloons, a Premium ship, containers, one day of Premium Account time and one Supercontainer. This type of Daily Shipment will only be available to players that reach Account Level 2 in their Service Record after the point that Daily Shipments hit the live servers. If you are already at Level 2 or higher when Daily Shipments are launched, you will have no access to this type of Daily Shipment.